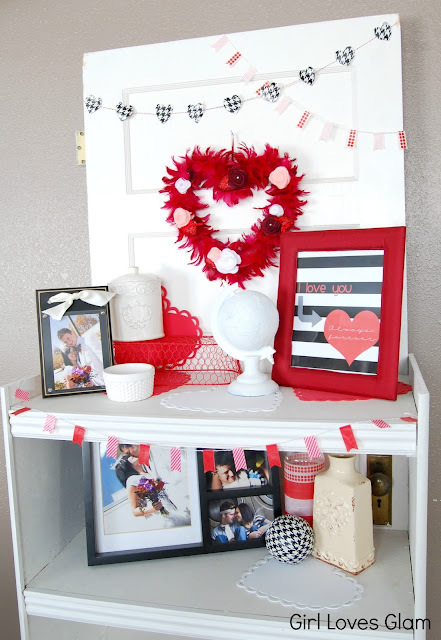 I am really happy with how my Valentine’s Day decor turned out! I was planning on going with just the typical red, pink, and white decor. 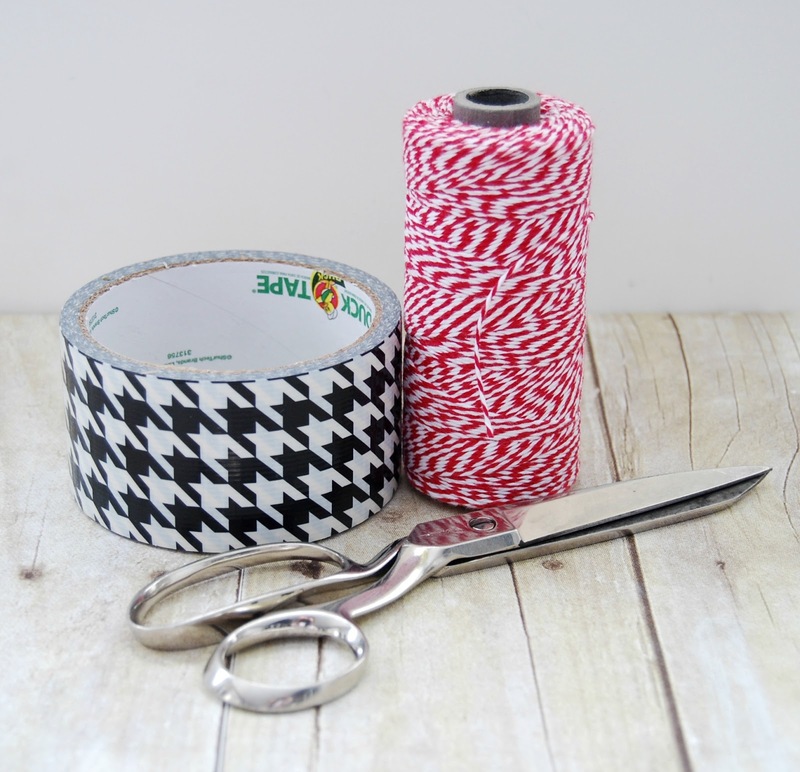 Then, I saw my houndstooth Duck tape. Plans changed. I am so glad I added the black accents. I have had the wreath for a few years. My mom and I made them and I still love it! I was excited to add a few of our engagement and wedding pictures to really add the love vibes. 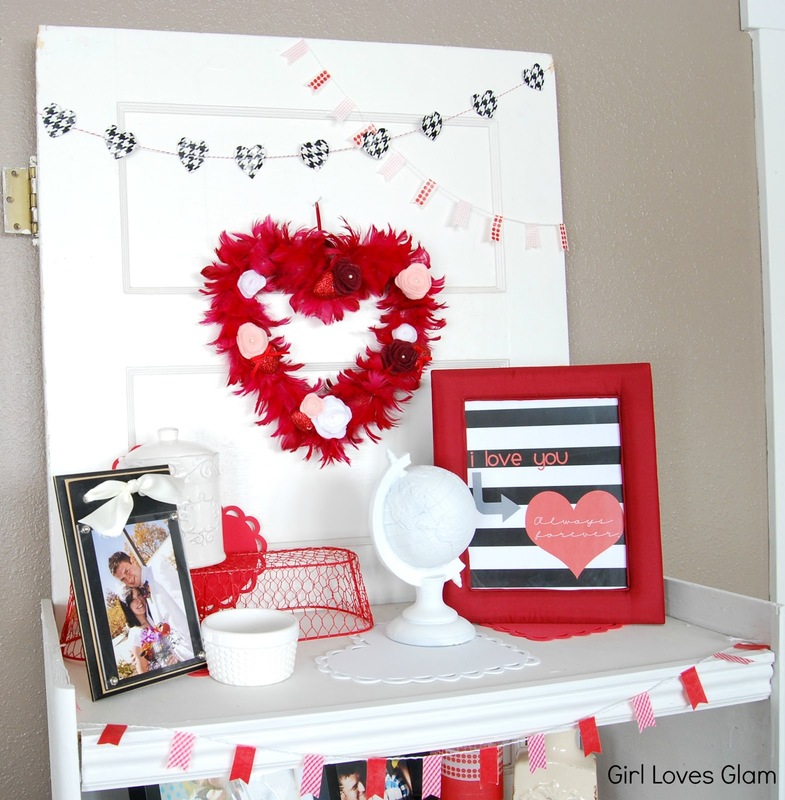 I go the red wire basket, the foam hearts, and the little white bowl from Target. 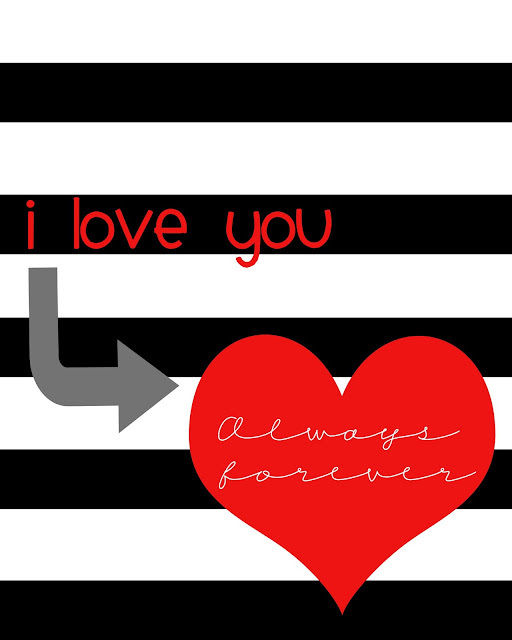 One of my favorite songs used to be “I Love You Always Forever”. I was probably 10 when it came out, but I always remember loving that song. I thought it would be fitting to make a printable inspired by that song. I accented it with my globe that I got for Christmas because the next line in the song says “Near or far, closer together” and I thought the globe was fitting. This printable is for personal use only. Just right click on the image and save it to your computer to print. 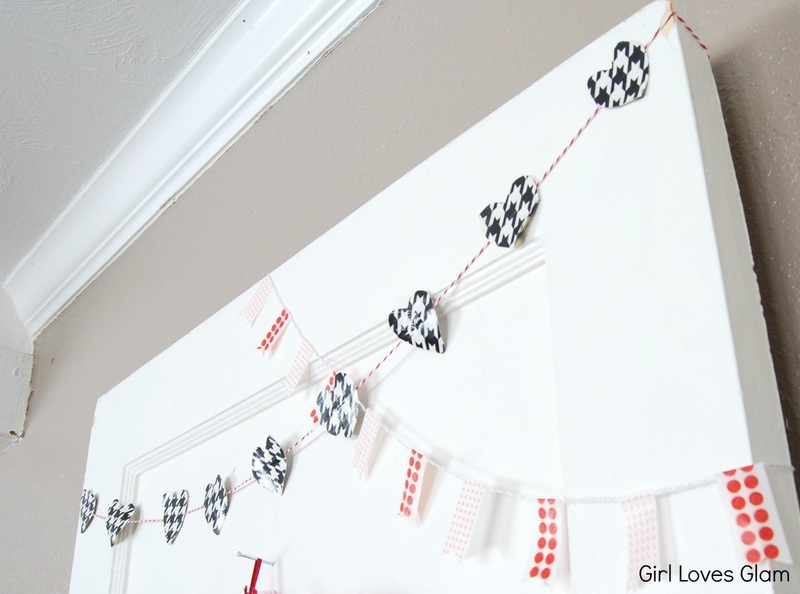 I decided to try out the washi tape banner trend that I have seen all over the place. I love how they turned out. 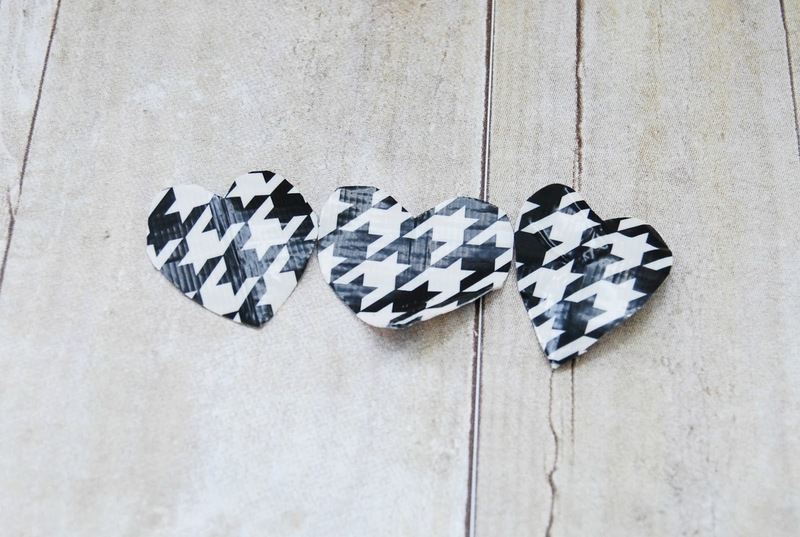 I made my duck tape heart banner that I am basically obsessed with too. Now I am definitely feeling the love! The time is here! Time to pull out all of the pink and red! Valentine’s Day is less than a month away! I got my faux mantel all set up and I am excited to share with with you tomorrow. 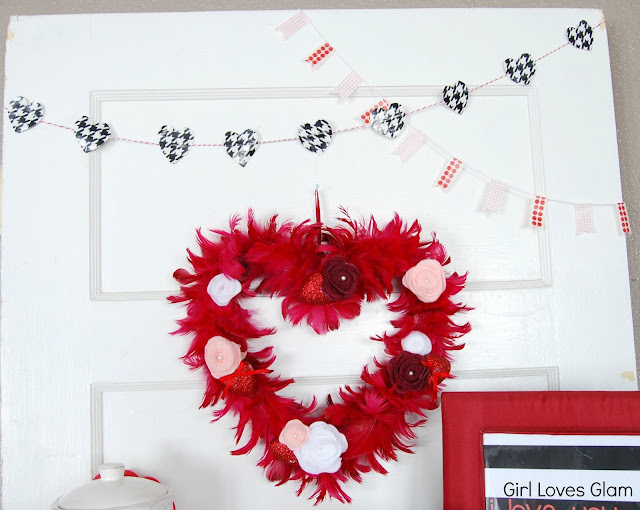 Today, I am going to show you how I made a simple Valentine garland out of one of my favorite products in the entire world, duct tape. 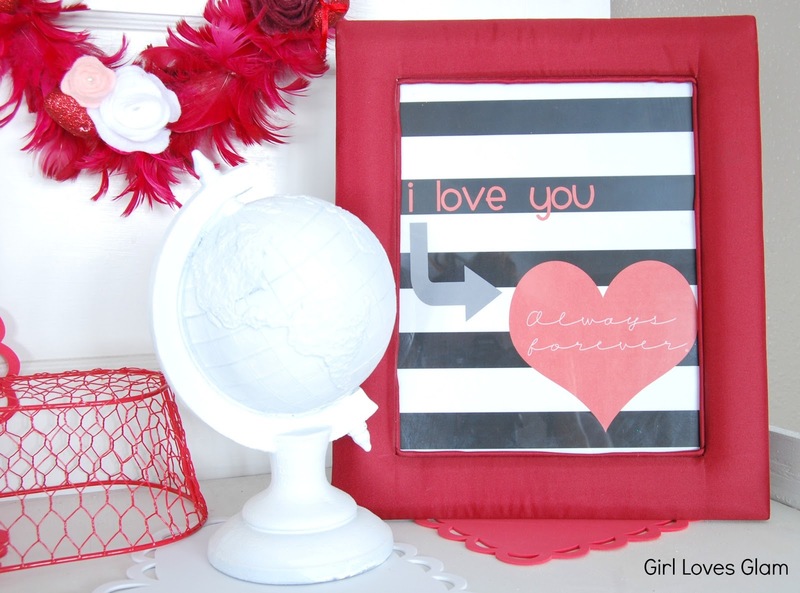 I love duct tape crafts and bringing it in with my Valentine’s Day decor was really fun for me. Cut a piece of twine the size that you will want your garland to be. 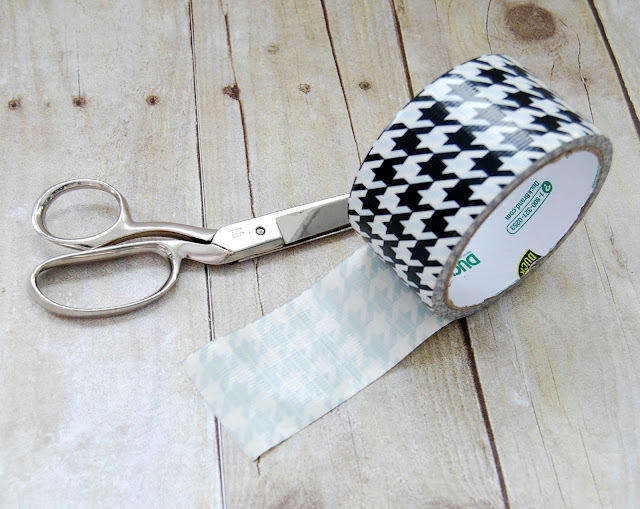 Cut a strip of Duck Tape about 5-6 inches long. 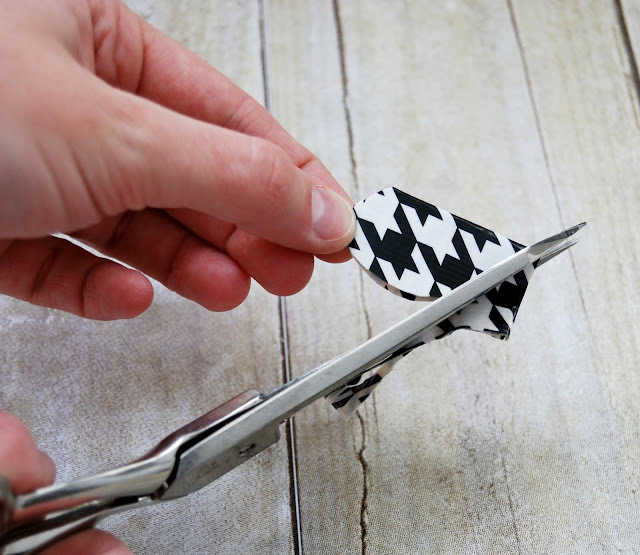 Fold the tape in half over itself. 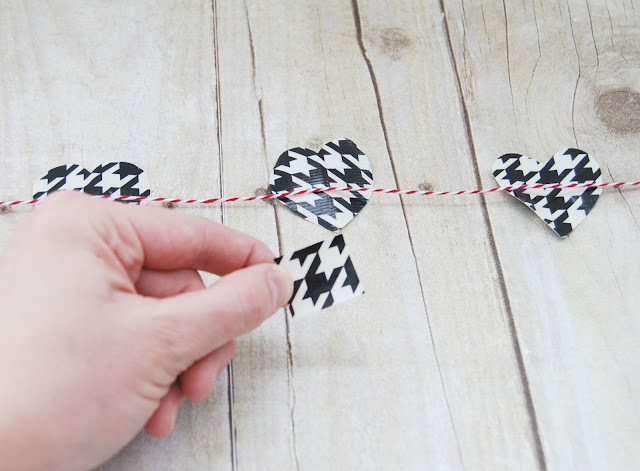 Fold the tape in half again and cut half of a heart shape. 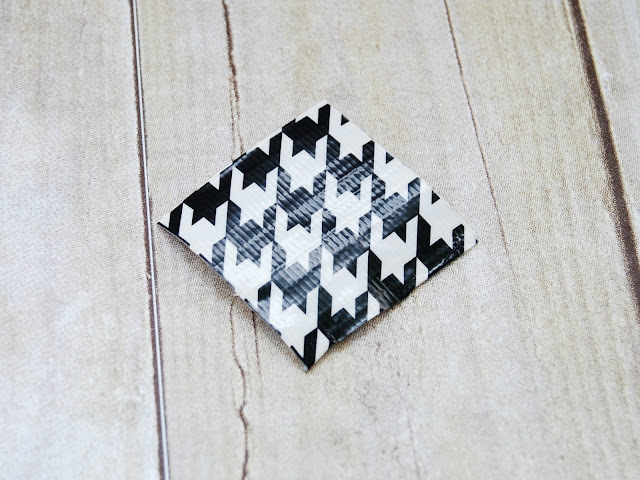 Unfold it and you will have a full heart shape cut out. Repeat those steps until you have enough hearts for your entire garland. Lay the hearts out, evenly spaced. 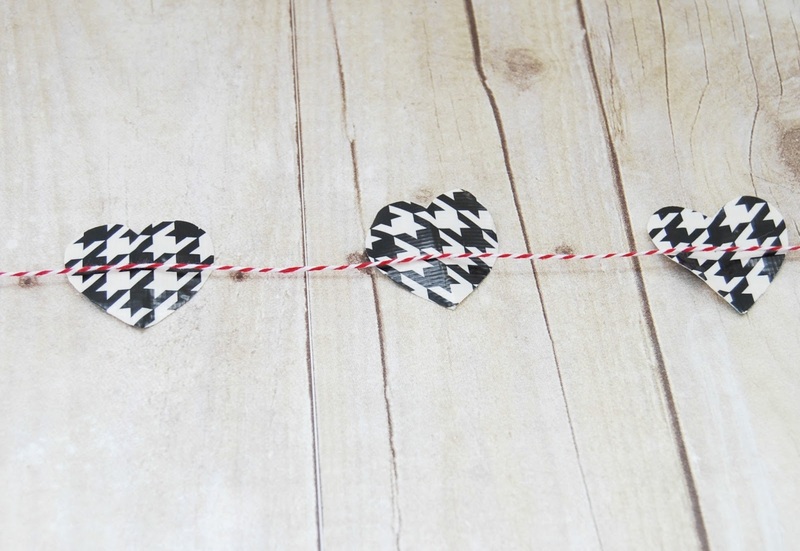 Place the twine on top of the hearts. 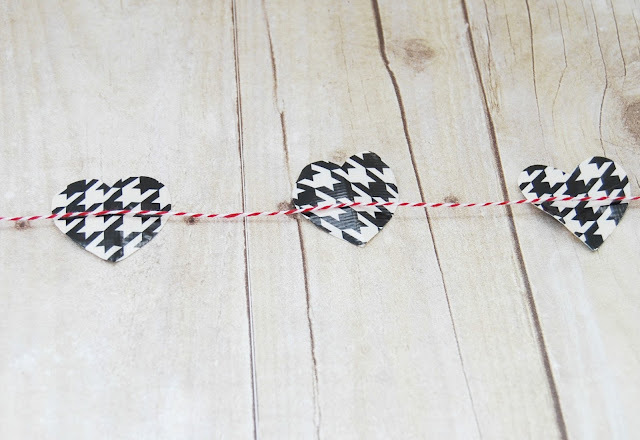 Cut small squares of the Duck Tape to put on the backs of the hearts to tape the string to hearts. Hang it up and you are done! 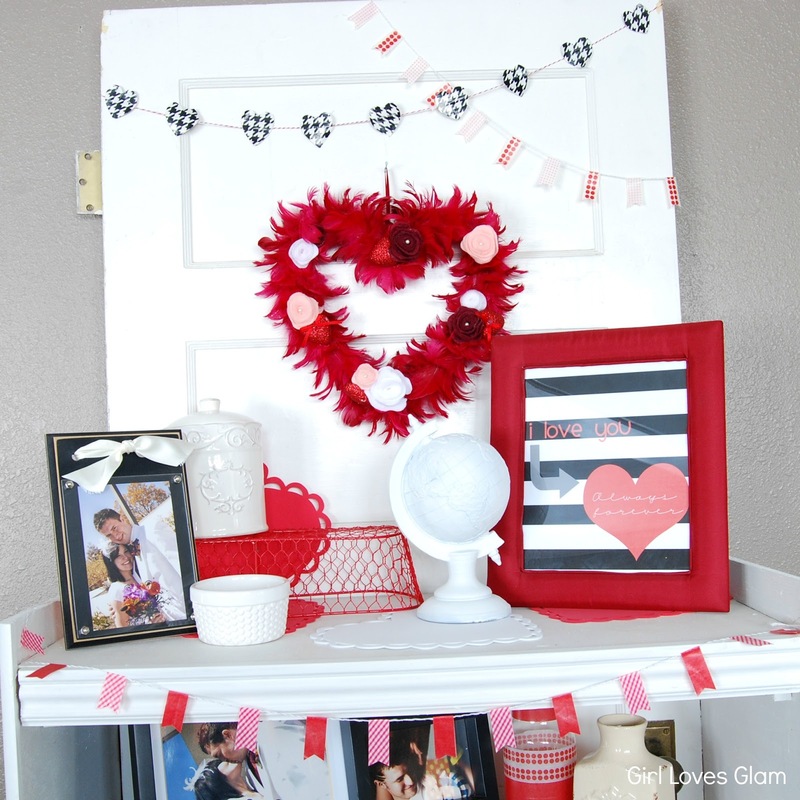 I can’t wait to show you the rest of my Valentine’s Day faux mantel tomorrow! 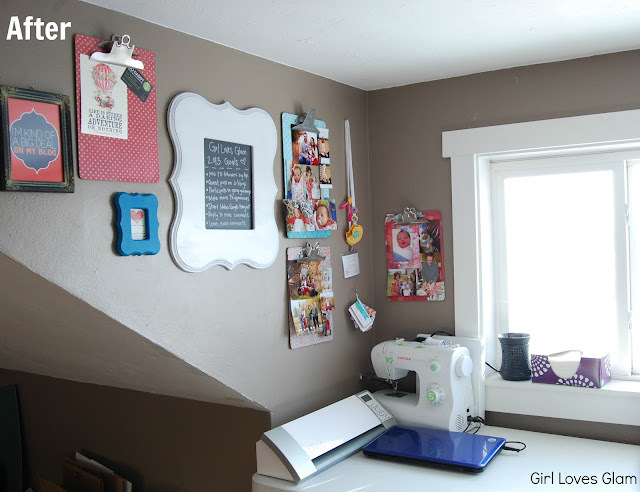 My Home Office Organization Ideas! Well it is a new year, that means it brings on all sorts of new goals, plans, etc. Of course everyone seems to want to be more organized with each new year. Organization is something that I am really passionate about… Maybe too passionate about at times? Maybe. I love taking an unorganized space and creating something new and refreshing. I am participating in the New Year’s Organizing Revolution Challenge where each week you organize a different space in your home. 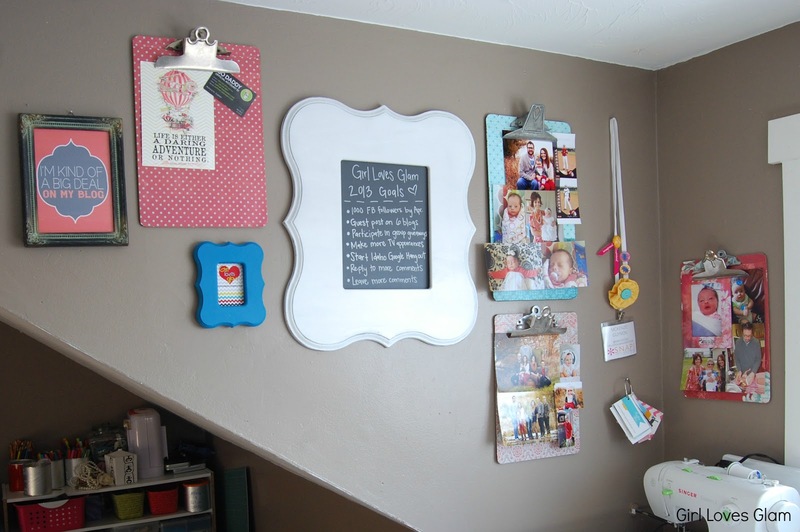 It gives me an excuse to organize some of the places in my house that have been ignored! First up, the home office! 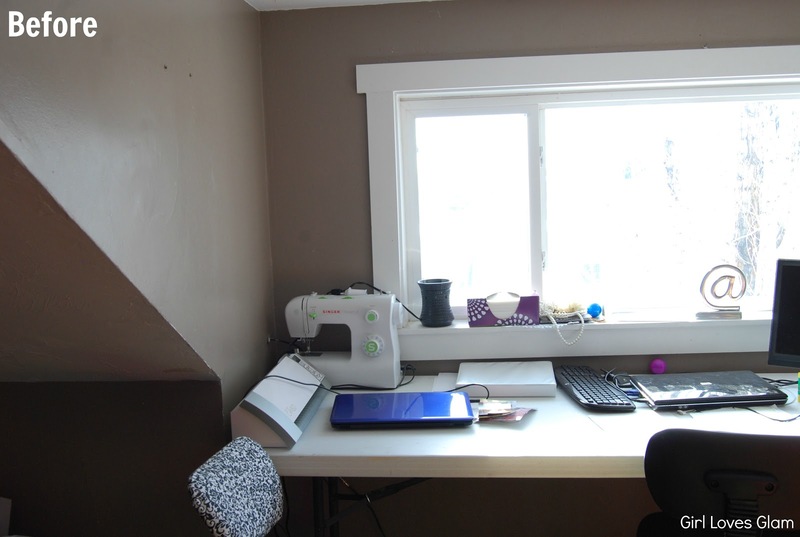 Before: I had tons of pictures, notes, business cards, etc stacked up in the window seal and on the desk. I only get half of the table because Dave uses the other half so I had to get a little creative, not that there is anything wrong with being creative! That is when the good stuff can happen! I knew that I wanted to have some clipboards to be able to clip anything I needed so that I could have it handy. 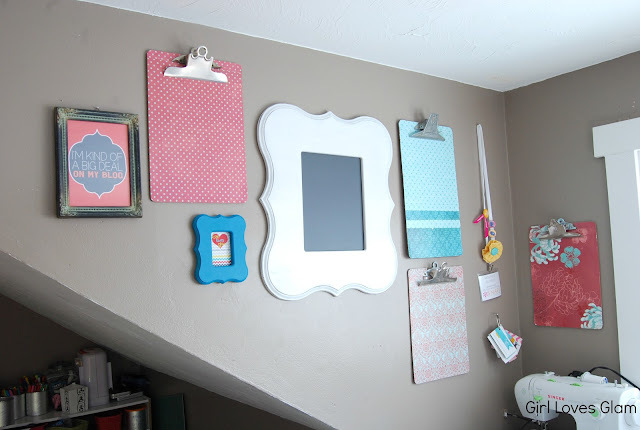 By putting some scrapbook paper and Mod Podge onto the clipboards, I was able to make them functional and be able to match the rest of the space nicely. I put a cute framed chalkboard in the center so that I could easily take notes on there. I will have a tutorial for that up within the next few days! 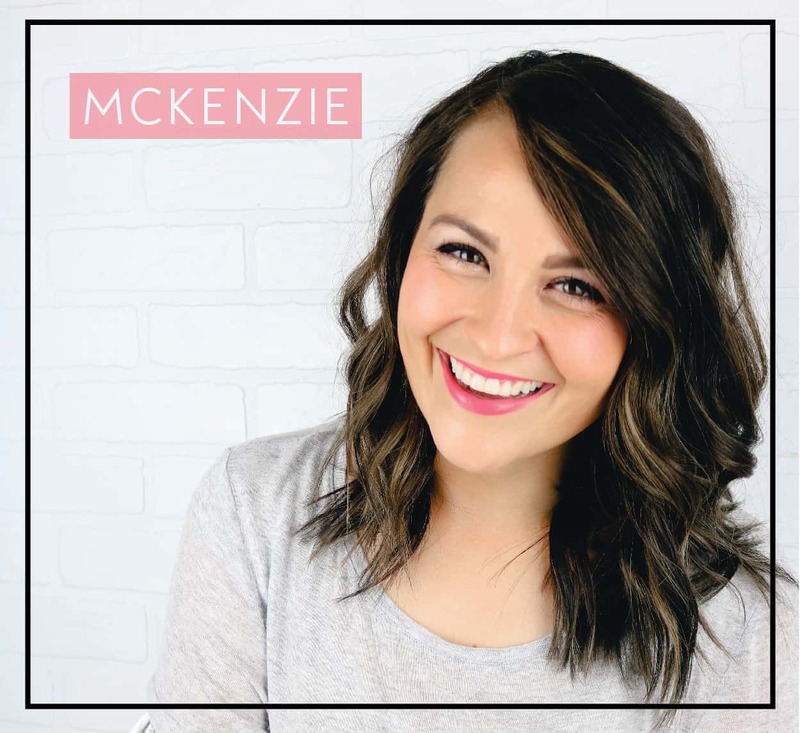 I love the artwork that says “I’m kind of a big deal on my blog” because really, it is the only place I am kind of a big deal! I framed one of my business cards for a little inspiration and reminder of who I am! I punched holes in all of the business cards I have received and put them on a ring to hang on the wall so I could find them all easily. I also hung up my badge from the Snap conference and I plan on adding to my conference badge collection this year! I love how it all looks with the pictures clipped up and the goals written on my chalkboard! I get a lot of inspiration from my family, so I believe that having their pictures on my clipboards is a great way to feel inspired and to remind me of what is most important. I love my new, clean, organized space! 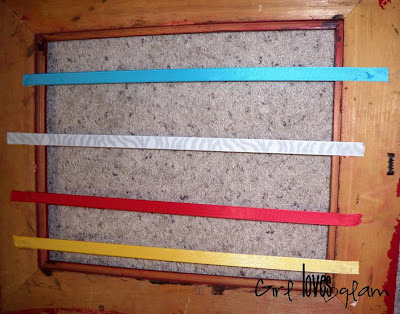 You can find the rest of my organization ideas here! 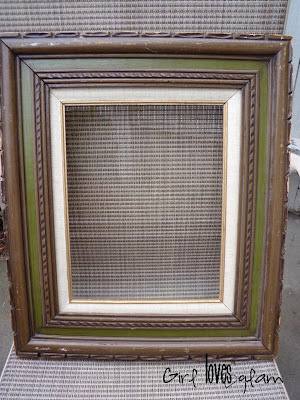 First, I went thrifting and I found this UGLY frame. I loved the size and the details of it, and it didn’t have a price. The gave it to me for $1! What a steal! Then I put some garbage bags down and sprayed and sprayed until I liked the color of my frame! I chose red, but it would be cute in many other colors! 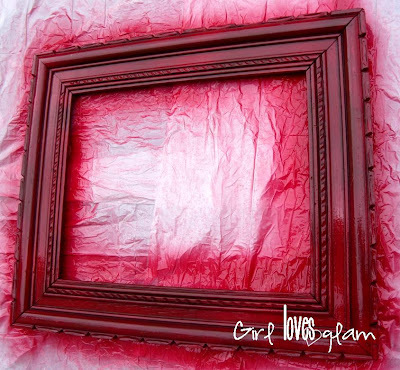 I let the paint dry and layed the frame down and measured the sides of it. 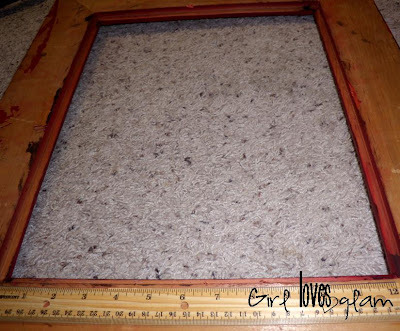 The important thing to note is that this frame will hang horizontally, NOT vertically. 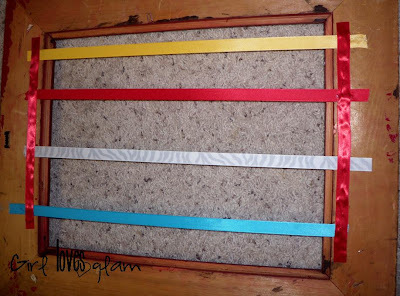 So measure the sides of the frame that will be lined vertically to be sure that your ribbon will run horizontally. 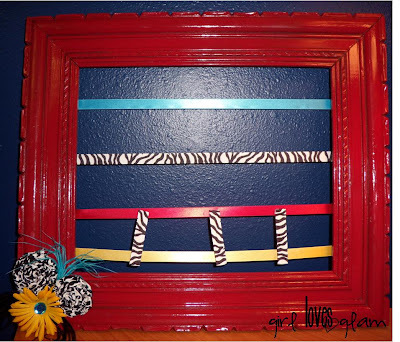 Decide how many ribbons you can fit on your frame, keeping them about 2-3 inches apart and mark where the ribbon will be. Then I picked out the ribbon I used, and cut them to the length I needed them to be so that they will go from one side that I measured, to the other side that I measured. 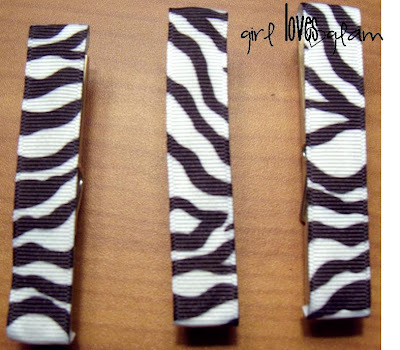 With a hot glue gun, I glued each piece of ribbon to the spots I had measured out. 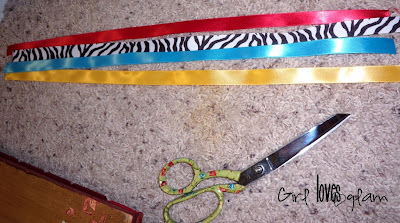 The ribbons need to be glued in the horizontal direction. This is the only way to make the headbands stay on. 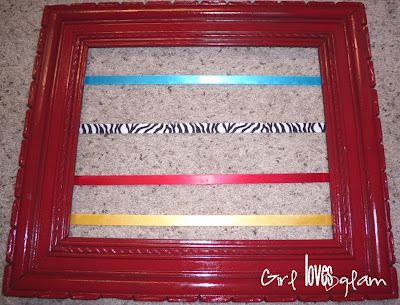 Remember, glue the the ribbon so that the right sides are facing the front of the frame! 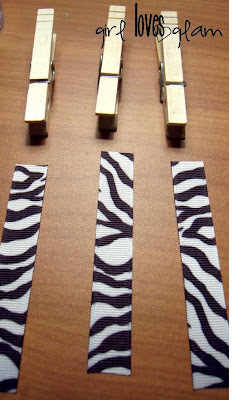 I also glued 2 extra pieces of ribbon to each side to be sure that my ribbons are sturdy. Now this is what my frame looks like! I need to glam it up though! You can leave it like this if you want, but I had to accessorize! 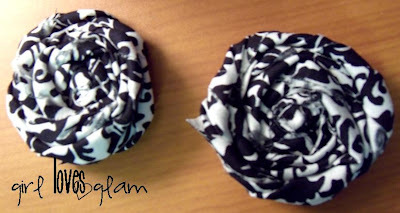 I made 2 rolled fabric flowers. If you don’t know how to make these, there is a pretty helpful tutorial made by Me and My Brightsides, here. Then, I got some feathers, and some petals from a silk flower. And I embellished my flower, and arranged them on my frame. I just used hot glue again, and put them all on my frame like so. 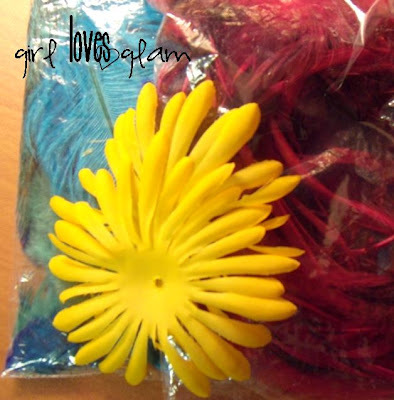 I create a lot of “Hippie Headbands” and there really isn’t any way to store them unless you stuff them into a box and then they get squished! So I decided I would hang them up with clothes pins. I made 3 lined clothes pins for my frame. 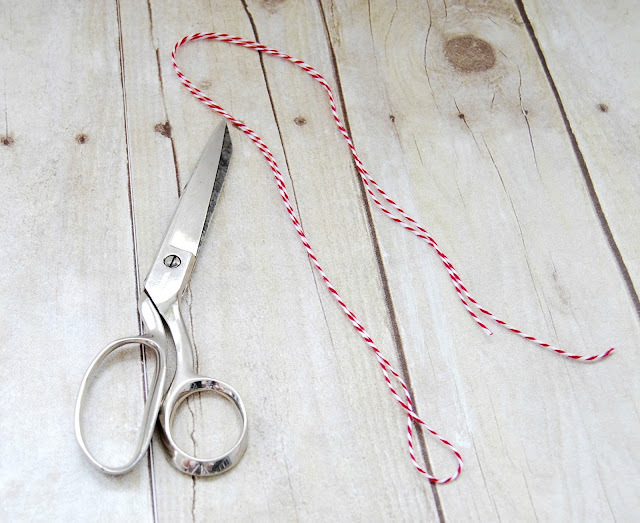 I cut out ribbon that would go around one side of each clothes pin. Then I hot glued the ribbon to the clothes pin and folded the ribbon over and glued it too so you couldn’t see the unfinished edges of the ribbon. Now I have 3 super cute clothes pins! 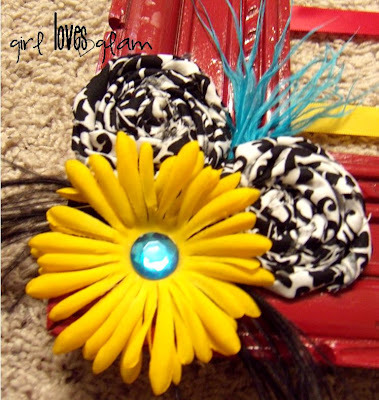 My hair accessories! 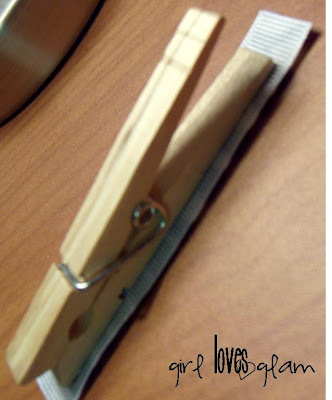 I love this because I can also comb my combs onto the ribbon because the ribbon is horizontal. I clipped my hippie headbands on my clothes pins, clipped my regular clips on the ribbon, and put my headbands over the ribbons! Now all of my feathers won’t get ruined! I hope you enjoyed this tutorial as much as I enjoyed making this project! 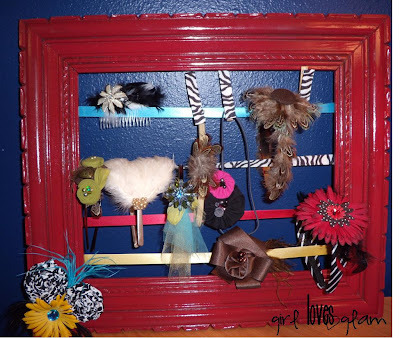 Look for more tutorials coming your way and don’t forget to check out my hair accessories so that you can fill up your new Headband and Accessory Holder!